I am very happy to announce my 150th recipee which is a special recipee. I take this oppurtunity to thank all of my blog friends & followers to make it a fine success. I also like to thank my husband who is my main motivation who also is passionate about food & always says that he is more obsessed with my food.I also wish to dedicate this recipee to my brother (my hubbys friend) Mr. Abhay. Happy Tamil New year to all. I wish everyone all the very best for the future. Heat butter in a heavy bottam pan, add rice & saute few mins. Add milk & rose water boil until almost done. Add double milk & rose syrup . Mix gently & add ground black cardamom powder. Serve hot or cold garnished with rose petals. Congrats on your milestone. Rose cream pudding looks de....licious. Congrats for your 150th post.Its looks very delicious. Happy New year to you and your family.. Congratulations on the 150th post...Kheer looks delicious..
Congrats on your mlestone and happy new year! great dish to celebrate! Congrats on ur 150 posts and wish many more. Delicous pudding! Congratulations.....Pudding looks droolworthy. Happy Tamil new year to you too. This pudding is very new to me,thanks for sharing vidhya! And congrats on reaching milestone! Happy 150 post Srikar...pudding looks great for the occasion..!! Lovely post & great click :-). Happy Tamil New Year!!!! 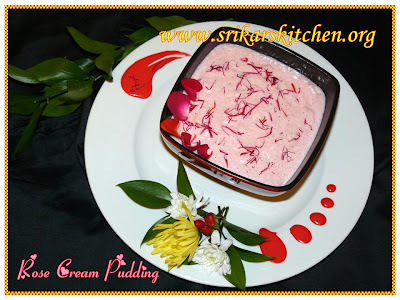 Congrats Sri on ur 150th post....beautiful pudding....love the way u presented it....Keep rocking. Congratulations Sri. Happy new year to u and ur family. Rose pudding looks lovely. Pleasant color! congrats on your 150th post! expecting more from you. Congrats on your 150th post! Happy New year..
Pudding looks fabulous! Lovely colour and a wonderful decoration :) Gr8! Congrats on your 150th post.Very colorful! What a great way to celebrate your 150th post! Pudding looks so pretty and gorgeous. Yummy. Congrats on the 150th post and wishing many more from you! Congrats on you 150th post. The rose pudding looks fabulous.Wonderful presentation and lovely color. Happy New Year to you too! Well done on your 150th post! Congratulation and a very happy new year to u. 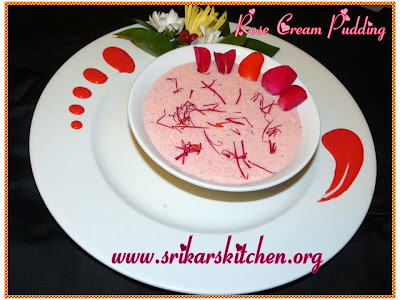 Rose cream pudding looks delicious. Pudding looks colorful and yummyy!! Well done for your 150th posting. The pudding looks soooo delicious. Srikar, congrats on completing the milestone. and that pudding looks so pretty in pink! congratulations on your 150th post! 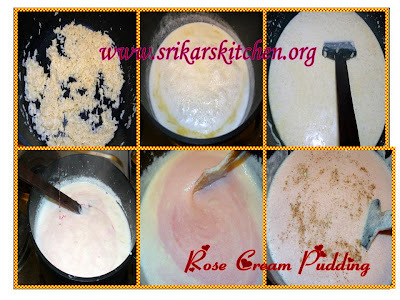 rose pudding is delicious.. Happy New Year sweetie and congratulations!